For the lowest price fireworks in Missouri, look no further than Hannibal! 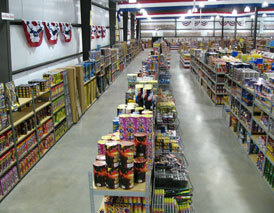 The Fireworks Superstore LLC was built in 2006 and is open year-round. Tom Marx and son Josh Marx created The Fireworks Superstore with two things in mind. To provide the largest fireworks selection in America under one roof and the lowest price fireworks hands down. Both of these goals have been achieved! The Marx family has a rich history in fireworks, having been in the fireworks business for over 51 years. Edward Marx, founder of Marx Fireworks and son Tom Marx, first opened a small 12 ft. by 20 ft. wooden building to sell fireworks in Oakwood, Missouri back in the mid-sixties. In the mid-seventies, Tom Marx moved the fireworks operation into a seasonal tent located outside the city limits of Hannibal, Missouri on Hwy. 61 and changed the name to Big Tent Fireworks. Big Tent was quickly a source for the lowest price fireworks around and was open annually from June 20th to July 10th of each year until 2006. The tent grew in size over the years. Our current 90,000 sq. 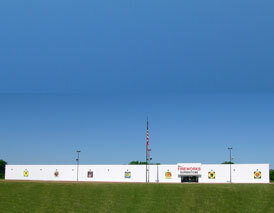 ft. structure houses a massive selection of fireworks products and is currently expanding to 105,000 sq. ft. The store represents many top China Fireworks product lines and stocks over 4,000 different items priced at very attractive price points. It’s truly a one-stop shop for the lowest price fireworks paired with quality, service, and a selection second to none. The store is also handicap accessible. 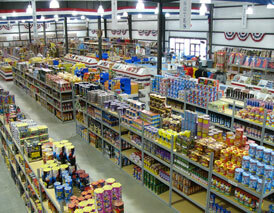 The Fireworks Superstore LLC, now one of America’s largest firework’s outlets, continues to grow in sales each year. 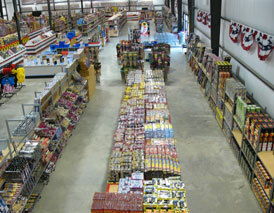 The Fireworks Superstore LLC is truly an overwhelming experience for the true pyro customer! Missouri Law: The minimum age for purchasing Fireworks is 16 years old. Missouri residents may puchase Fireworks from June 20th through July 10th and from December 20th throught January 2nd. Out of state residents may purchase Fireworks at any time during the year.